PLUCKY Dumbarton could count themselves unlucky to lose 1-0 to Ladbrokes Championship leaders Hibs at the Cheaper Insurance Direct Stadium. A crowd of 1,532 saw Stevie Aitken's men give as good as they got against Neil Lennon's star-studded team, and they did not deserve to lose all three points. In midfielder Lewis Vaughan, making his home debut after signing on loan from Raith Rovers, they had the man of the match, rivalled only by the equally positive Andy Stirling. Sons started brightly and had the first chance on seven minutes as Garry Fleming and Lewis Vaughan linked up, before a corner was won and cleared. Six minutes later Hibs were in front. Dumbarton failed to clear their lines and Kris Commons fired the ball home through a busy penalty box. The home side continued to play well and press forward, with Daniel Harvie and Vaughan inches from threatening an equaliser. After the break Dumbarton piled on the pressure on and enjoyed several half chances, but nothing would go in for them. 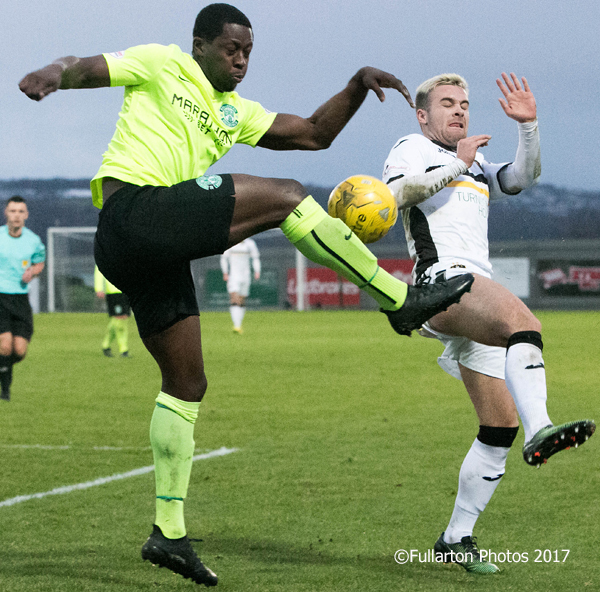 Christian Nade, on for Robert Thomson, and Mark Docherty came close to equalising as the one-way traffic continued as the final whistle approached. Just before the end Nade came agonisingly close to grabbing the goal Sons performance deserved when he got on the end of a Tom Lang cross, but it was not to be. Sonstrust man of the match Lewis Vaughan is pictured in a close encounter with Marvin Bartley.